Where To Buy Colloidal Silver? Many people aren't sure where to buy colloidal silver hydrosol, or which is a better product, etc... We hope you've found that our site contains information helpful in making your purchase decision! Please contact us with any questions at anytime! It's made with pure STEAM DISTILLED water. Our equipment will reject anything else! After production, we filter the colloidal silver again without using paper filters. We then rerun the batch for a maximum ppm's of 10, nearly the max possible for PURE IONIC! 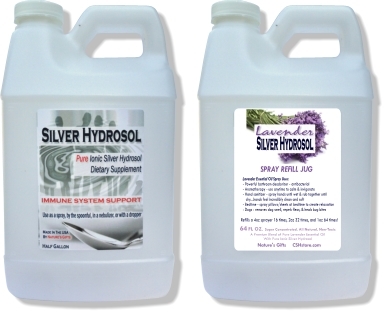 We encourage you to try your silver hydrosol in a variety of uses to experience all the different ways it can assist your efforts to be healthy! Please let us know how it helped! Please select your quantity, discount, or package deal! (change quantities in shopping cart) Low Shipping Costs! NOTE: If you are outside the U.S. or U.S. Territories, our site does NOT calculate International Shipping. We will contact you with the actual shipping charge. Great for new customers! So many ways to use our product so easily! Refill these smaller bottles time and time again! 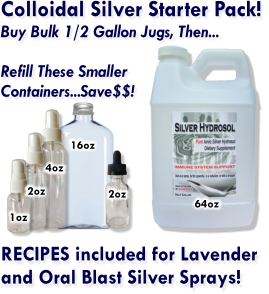 Our least expensive way to buy Silver Hydrosol. Excellent for prepping, easy storage! Buy 3, Get 1 FREE! Save 25%! Refill time and time again from our Half Gallon Jug! This is our very best gel! Essential oils are also antibiotic! 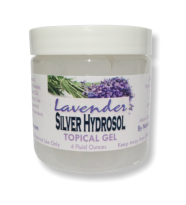 Lavender and Tea Tree Oils make our silver gel even more effective. 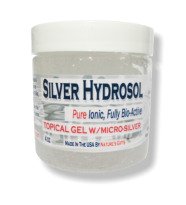 Silver Hydrosol and Micro-Silver create a potent antibiotic gel, having antibacterial, antifungal, and anti viral properties. For external use only. Try on minor wounds, bites, acne, with or without a bandage. 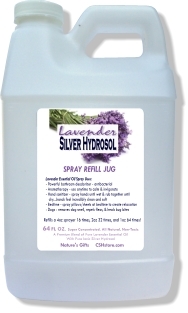 Our Lavender Silver Hydrosol Spray is AMAZING! Use it to deodorize, disinfect, aromatherapy, sanitize hands, eliminate dog smell, heal bug bites, repel fleas, and clean the energy in a room. Your mood WILL improve with your first use! The combo therapeutic effects off lavender and silver are deeply synergistic! FREE: a small funnel and either a 1oz or 2oz fine mist sprayer to get you started. More bottling choices below. This is an outstanding value as we give you our normal discount of 20% off the second jug! Buy 2 Combos, save 25%! 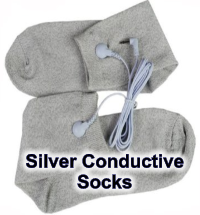 We love these REAL silver socks! 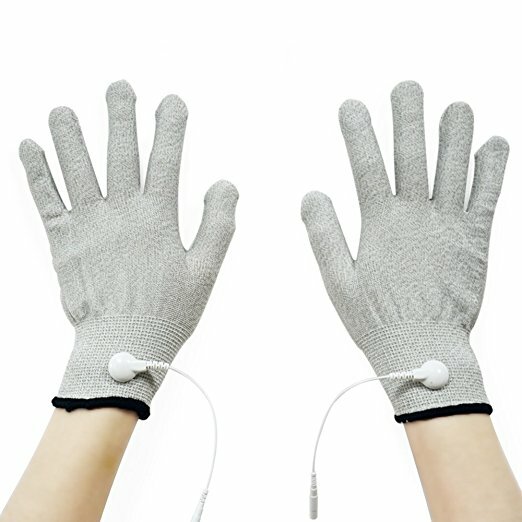 They are made for use with TENS machines for electromedicine, but we recommend them for sleeping and daily use at work and play! Rubber soled shoes keep us from "grounding", and the conductivity of these socks seems to help our bodies rebalance energy, the end result is a feeling of calmness. Users rave about how sleep improves too! Real silver fabric. Includes cables pictured. They are made for use with TENS machines for electromedicine, but we recommend them for sleeping, too, for all night grounding! 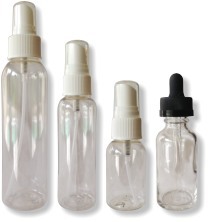 Empty spray bottles and the eyedropper are excellent companions to our half gallon Silver Hydrosol product above! Use them to spray minor wounds, bug bites, poison ivy, deodorize the air, to spray the bottle after a shower! Use the dropper for eyes and eyes or bandages. This allows you to split one bottle or jug up for use all around the house, in the car or at work! You can spray a mini-dose in your mouth, or inhale the mist, or sanitize your hands. Or share with friends and family! "Antibiotic crisis bigger than AIDS as common infections will kill, WHO warns"
A child's scratched knee from falling off their bike, common bladder infections among the elderly in care homes and routine surgery to replace broken hips could all become fatal as antibiotics are becoming increasingly useless, the World Health Organisation has said. Here's a related article about how Silver is being used to boost these antibiotics! "If you don't have an eye dropper, no problem! Just get a CLEAN NEW drinking straw, dip the end in the ionic silver water, cover the other end with your finger, and lift the straw out of the bottle. Then place the straw over whatever you want to apply drops to, and slightly lift your finger to allow drops to come out!"